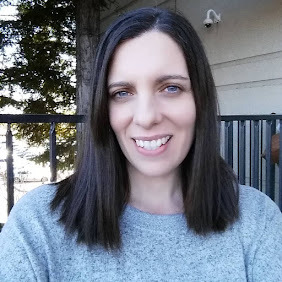 I have to admit this time around in my pregnancy that I have a mean sweet tooth! I mean I need cake, cookies and chocolates. I try to pull in the reins and only allow myself little treats here and there but sometimes it is hard. 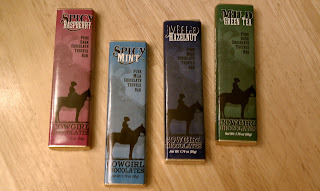 So imagine how excited I was when chocolates arrived at my door step, Cowgirl Chocolates to be exact! Cowgirl Chocolates is not your average chocolates, they are a rich European Chocolate and come in mild and spicy or a combo of both. Now I love chocolate but was a little skeptic of the Spicy flavors, after all I am fighting heartburn left and right here. First we my husband tried the Spicy Mint with milk chocolate and he really liked it. He is a big mint fan anyways and said that he liked the idea of mint having a spicy kick to it! I was not brave enough for all that spice :) Then we tried the Spicy Raspberry in dark chocolate. Although my husband is not a fan of dark chocolate, he actually enjoyed this one the most. He said there was something great about the mix of raspberry filling, dark chocolate and SPICE!! To me it was a bit too spicy, can you say wimp? Next we moved onto the Mild Green Tea in Dark Chocolate. 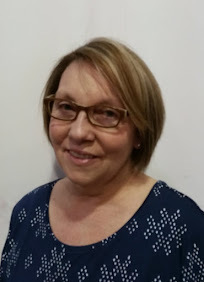 My Mom was the only one who was really a fan of this one. I think that we are not that big of Green Tea fans anyways, so the taste was a little foreign to us. Lastly my favorite was the Mild Hazelnut in Milk Chocolate, it had enough spice to know that there was something different about this chocolate, but not enough to take away from the Hazelnut and Chocolate taste. 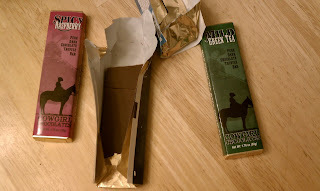 Needless to say I am a wimp when it comes to spice, but what I liked about Cowgirl Chocolates is that they seem to have a chocolate for everyone and every taste bud! 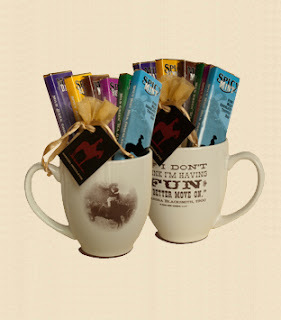 What a great gift idea, Cowgirl Coffee Mug with Truffle Bars. Want and need to know more about Cowgirl Chocolates? Check out there Truffle and Bar Flavor Guide, there are so many choices you might need to sample them all. What item do you want to try the most from Cowgirl Chocolates? *Limited to US residents; 18 years old and above. Giveaway starts November 14, 2011 and ends on November 28 , 2011 at midnight PST. Winner will be emailed and has 48 hours to respond before another winner is selected. I was not paid for this giveaway or post. The opinions on this item are 100% mine and may vary from others. The sponsor is responsible for providing the prize. I;d like to try the chipotle caramels. I would love to try their caramels!